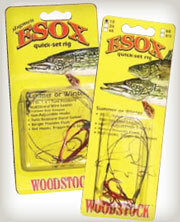 The ESOX rig works great with a Tip-up, Bobber, Dead-Sticking, Bottom Fishing and Trolling. Anglers all over the world are adding this fish catching machine to their year round fishing arsenal, for pike, muskie, walleye and other game-fish. 30 lb. nylon covered stainless steel leader adjusts from 1.5″ to 11″ to accommodate any size bait. The nickel bangle and red hooks attract predators from long distances. The 5/3 size used 80# stainless 1×7 strand and is not adjustable.